Contact Black Hills Energy to begin gas service and for service related questions. Contact Mid American Energy to begin electrical service, for service related questions, or to report a broken street light. Cable television service is available to Grimes residents through a franchise agreement with Mediacom Cable. Internet and telephone services are available to Grimes residents from Mediacom and CenturyLink and Mi-Fiber (internet only, where available). Please contact the service provider directly to begin service and for service related questions. 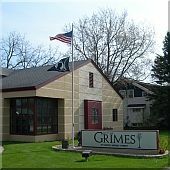 The City of Grimes contracts Waste Connections for solid waste pickup. Pickup is on Monday if you are south of 1st ST and Tuesday if you are north of 1st ST. Residents will be supplied with trash containers. Garbage billing is included on your monthly water bill and residents should contact Grimes City Hall to begin service. If your pick up is missed please call Waste Connections. Curb It! recycling is another service offered to Grimes residents. The green carts are emptied every other Monday, south of 1st ST and Tuesday north of 1st ST. Please refer to the sticker on the lid for your pickup schedule. If your pickup is missed please call Waste Management. (Please note that the smaller 18 gallon bins are no longer used). The City of Grimes also participates in the Compost It! program for yard waste disposal. Pickup is on Monday for residents south of 1st street and Tuesdays north of 1st st. Yard waste is only collected in Purchased Carts, Compost It! bags or "Kraft-style" bags with a Compost It! sticker attached. Carts, Bags and stickers can be purchased at City Hall. If your pick up is missed please call Waste Management at 515.244.7336.